One of our most common dinners here at our little garden home is bowl food. 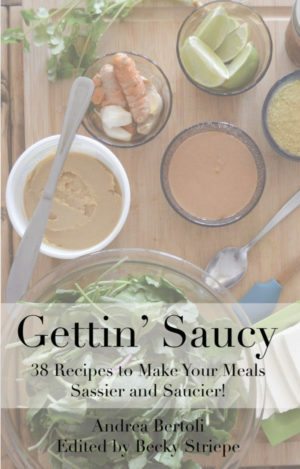 This usually involves grains (rice and/or quinoa), some beans, tofu, or tempeh, and fresh greens and other veggies- but the best part is the lovely dressings that I have been making. This is a good way to use up whatever veggies are around the house, and a good way for us to use the veggies are from our yard. Though the bugs have been eating our collards, kales, and other brassicca plants and the harvests are small, we did get some kale leaves and some early-harvested pak choi leaves yesterday for dinner. Mix it all up in a bowl until it reaches a nice smooth texture; there should be a good creamy consistency and a good balance of flavors. If it starts to separate, add more water to make it smooth again. It is very important to use the honey/sucanat to balance the flavors. Use the above ingredients without the tahini and add lots more miso, maybe ¼ cup or so; this is also exceptionally good with fresh ginger and extra garlic, maybe even some wasabi. This is good on tofu, rice/veggies, and/or soba noodles.